Discussion in 'Android Tablet Apps' started by jerryfan2000, Aug 27, 2010. Smart Taskbar is a - super launcher, task switcher, and also an app organizer that you can quickly call up on any window by swipe the edge of screen or by clicking a transparent trigger icon on screen. In most cases, you can complete app launching in 2 finger clicks (1st swipe, and 2nd click on app icon to launch). Possibly the fastest way to quickly launch or switch between applications. (1) Edit App dialog. Removed All App and Task from the list. Display in alphabetical order. (1) Enhanced the trigger area for icon mode a bit for easier activation. 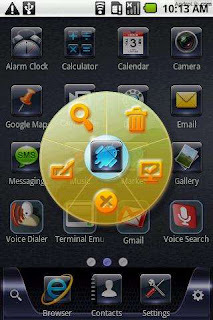 Get Smart Taskbar by searching 'Smart Taskbar' in Android Market. Looks cool! Is it free? Using it. Seems to be free from Market. Great application, espouse for me to get to home without using Back button. Have to download it then. I second that. The lack of a "Home" button was driving me crazy on the Haipad M701. This is a lifesaver.